Have you heard about the folks who don't vaccinate their kids, or thought about not vaccinating your children yourself? There is no real way of knowing whether the number of parents who decided to say no to vaccines for their children has gone up in recent years, or whether the internet has simply allowed them to be more vocal about their choices. One thing is for sure those who do vaccinate, the vast majority, is scared of these vaccine rejectionists and the long-term consequences of their choices. We ll take a look at why vaccine rejectionism is dangerous. Vaccine rejectionists often claim to be extremely educated about vaccines and say that they have done a lot of research. A quick look at some anti-vaccine message boards tells us that these folks, who have turned to the university of Google for their information, believe that vaccines cause diseases other than those they are supposed to protect from (autism is a popular one), that the diseases we vaccinate for are not dangerous, or that they are only in existence because of vaccines. An equally quick look at geographical pockets where vaccine rejectionism is prevalent, or at life in developing countries, tells us a different story. Would you really believe you are as knowledgable as an immunologist after reading some books, or even the vaccine s package insert? Head over to India, where polio is still common, for a very visual reminder that vaccine preventable diseases do still exist, and can be devastating. If you are trying to conceive and thinking about not vaccinating, perhaps looking at what these diseases really do is a good idea. 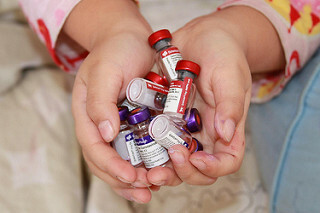 Newborn babies are not protected from diseases like pertussis (whooping cough) yet, and those who suffer from certain autoimmune disorders are never able to receive vaccinations. Premature babies are especially at risk. The common argument that you would have nothing to worry about if you believe vaccines work does not fly. There are people who genuinely cannot receive vaccines, and they are protected by the rest of us getting our shots. The herd immunity concept must be familiar to most people. Simply said, it means that the higher the percentage of vaccinated people in a population, the less likely that the disease (measles for instance) will be spread. Vaccines are not 100 percent effective, but if we are all up to date on our shots we will be protected better. If, on the other hand, fewer people get vaccinated, vaccine preventable diseases are bound to return. Did you know that the smallpox vaccine was the first successful vaccine? When do babies get their first vaccine shot?